The mission of the Oxford County Soil & Water Conservation District is to provide leadership, learning and technical knowledge in the management and conservation of agricultural and natural resources by integrating and disseminating local, state and federal resources. 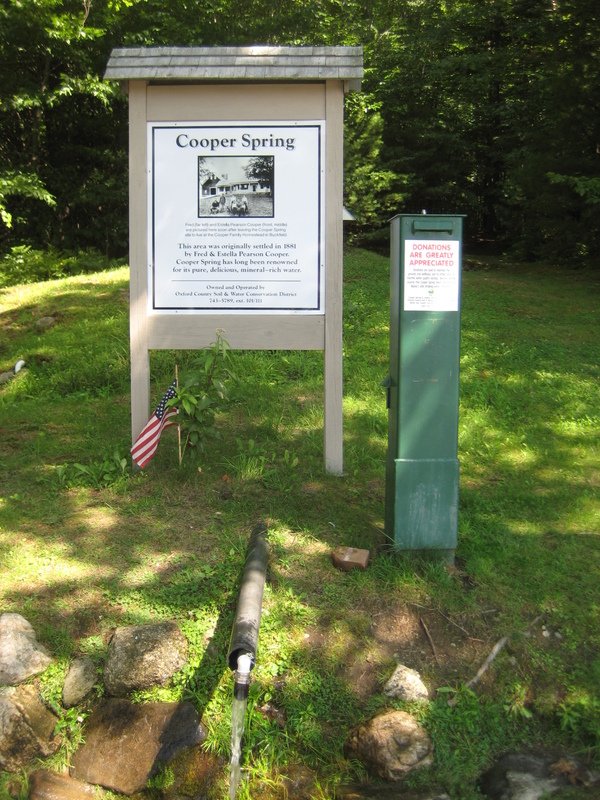 Cooper Spring is a public, road-side spring owned and operated by the District. It is located on Mt. Mica Rd. on property that was the former homestead of Fred and Estella Pearson Cooper, who settled in this area in 1881. The spring water is tested monthly for coliform bacteria and annually for nitrates and nitrites to assure that it is safe to drink according to Maine Drinking Water Program standards. The water is of very high quality and purity (we receive complimentary notes and comments about it all the time!) Recent interest in it’s mineral content and other water quality parameters prompted us to get it tested for a larger group of common elements. We were very pleased with the results. If you would like to see the results of our bacteria tests from 2017 to present and the Comprehensive Test click on the links below.